Why do well-educated, highly Americanized, and financially secure Jews join a synagogue and participate in its religious life? This study of Conservative Jews examines the largest movement of synagogue-affiliated Jews in the United States, a group that outnumbers the combined membership of Reform and Orthodox congregations and a population that adheres to a centrist version of Judaism. The scholars who contribute to this study ask a series of provocative questions: How do these Jews negotiate the tensions between the traditional values of their religion and modern sensibilities? What meaning do they find in synagogue participation? How crucial are rabbis in the "success" of congregations? 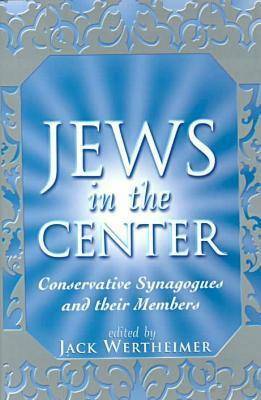 Written by a team of scholars employing the tools of demography, ethnography, sociology, history, and comparative religious studies, Jews in the Center offers the most comprehensive view of any religious movement within American Judaism----and indeed, one of the most detailed studies of any denomination in American religious life. Jews in the Center seeks to understand how synagogues function as congregations and to what extent they allow for individual self-expression. By focusing on a mainstream population, this book sheds light on religious people who generally receive the least attention----the broad center who neither retreat from society nor blur all boundaries between their religion and modern American culture.